These are our favorite new must haves! Everyone at Glorious Color is having a great time embellishing these for gifts and for ourselves. They are so useful. Some of our friends are even using the small bag to hold all the charging gizmos for their iPads, phones, and cameras. 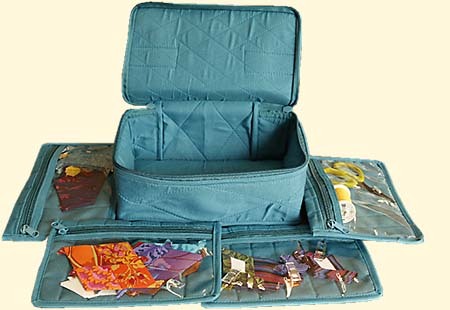 The Original Craft Organizers are made of plain quilted cotton with zippered compartments inside. The Original small bag is 5" x 6" x 3". It has 6 zippered compartments sewn inside. It is perfect to hold small notions for applique. The Original large bag is 7" x 9" x 3" with 6 zippered compartments sewn inside. It is is handy to hold rotary cutters, threads, scissors, and marking tools. The new 4 pocket organizer is slightly bigger than the large and has 4 removable zippered compartments. This makes it handy to store notions and an ongoing sewing project. We love this one for our Glorious Hexagon project as the finished hexagons are easily stashed in the bottom. Tote Bag: 5" x 6" x 3"
Tote Bag: 7" x 9" x 3"
Tote Bag: 9" x 5 1/2" x 4"